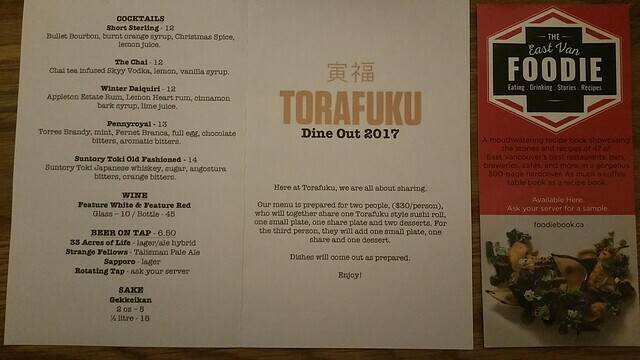 My very first Dine Out Vancouver 2017 and my first experience of Torafuku as well. They open 5.30pm and are pretty much packed shortly after. People turned away at the door for not having a reservation, but it's Friday and the first day of Dine Out, so who knows? Everything on their dine out menu sounded really interesting, plus they have veggie options, so it's hard to go wrong picking this place. 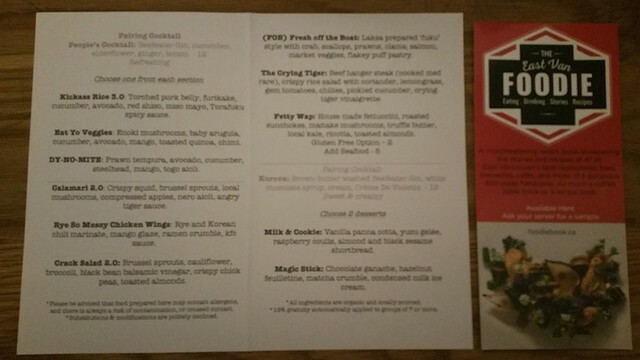 $30 per person, and best to go in pairs since you choose 3 plates TO SHARE and your own dessert (from 2 choices). That works out to three plates weighing in at maybe $16 each. For what you get though that's OK value. Wouldn't say it's a great deal cost-wise but it's delicious. 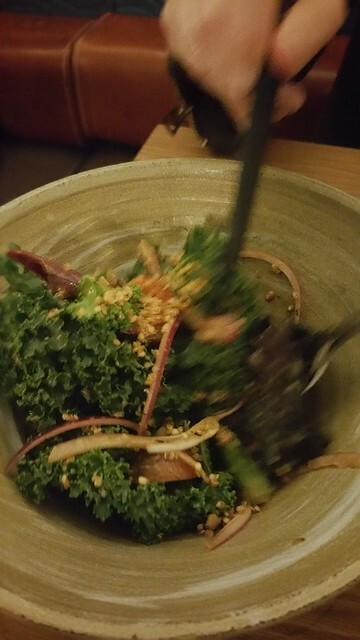 We also got a free kale salad. Did everyone get one? Will everyone get a random daily special freebie? Hard to say, but if so, maybe it's a sneaky dining experience factored into the cost AND you get 4 plates instead of 3 making it a better deal. Hmm. Kickass Rice 3.0: Torched pork belly, furikake, cucumber, avocado, red shiso, miso mayo, Torafuku spicy sauce. Eat Yo Veggies: Enoki mushrooms, baby arugula, cucumber, avocado, mango, toasted quinoa, chimi. 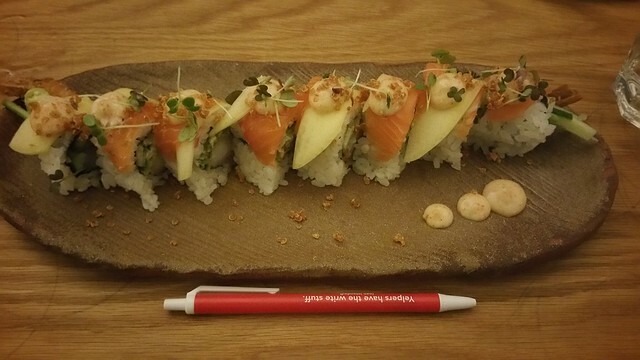 DY-NO-MITE: Prawn tempura, avocado, cucumber, steelhead, mango, togo aioli. Calamari 2.0: Crispy squid, brussel sprouts, local mushrooms, compresed apples, nero aioli, angry tiger sauce. Rye So Messy Chicken Wings: Rye and Korean chili marinate, mango glaze, ramen crumble, kfc sauce. Crack Salad 2.0: Brussel sprouts, cauliflower, broccoli, black bean balsamic vinegar, crispy chick peas, toasted almonds. 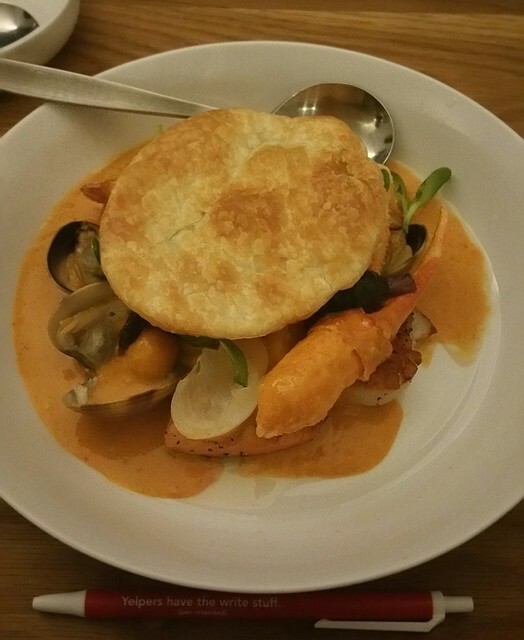 FOB (Fresh off the Boat): Laksa prepared ‘fuku’ style with Crab, Scallops, Prawns, clams, salmon, market veggies, flakey Puff pastry. Fetty Wap: House made fettuccine, roasted sunchokes, maitake mushrooms, truffle butter, local kale, ricotta, toasted almonds. Milk & Cookie: Vanilla panna cotta, yuzu gelée, raspberry coulis, almond and black sesame shortbread. 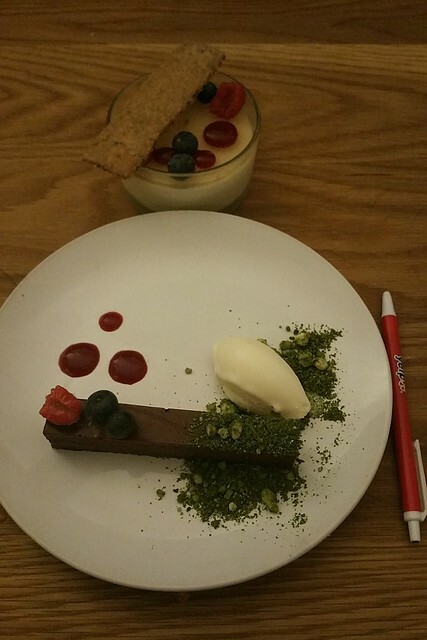 Magic Stick: Chocolate ganache, hazelnut feuilletine, matcha crumble, condensed milk ice cream. One long roll to share. Pretty tasty except strangely the mango was quite flavourless -- so mildly sweet that I could barely taste it except when I peeled it off my piece of sushi. Possibly a fluke occurrence, or they didn't want it to overpower the rest of the roll (which I wouldn't be in favour of). Either way, eat this sushi slowly and mindfully for best results. Pretty interesting with a lot of ingredients. 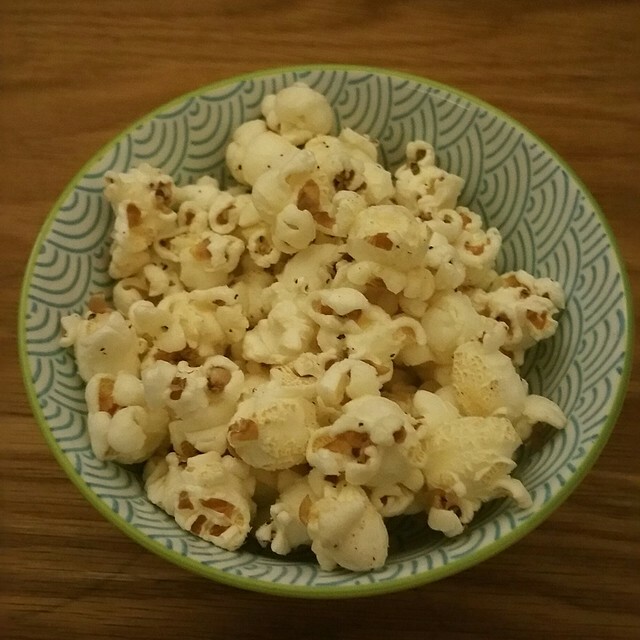 Not very light / fresh looking but pretty tasty. 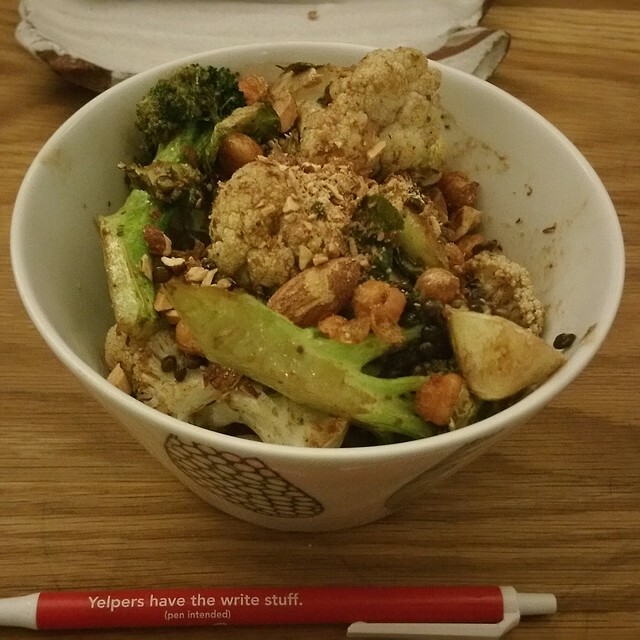 Don't just pick up the big veggie chunks -- get the spoon and dig around for the smaller bits. Would probably have been tastier if it had been served hot. Only one "crab" -- that is, one claw. Don't hog it people -- remember your dining partner, 'eh? Very mild as far as spiciness goes. Get that spoon and don't be shy about lifting that plate to get at the coconutty sauce because it's tasty! Not really getting the idea of this dessert. Flavours maybe too subtle for me. Yuzu jelly on top lacking sharp citrus tang that would have helped make it a refreshing addition to the dessert, so if you're looking for an uplifting flavour note to end your meal, neither dessert's going to do it. The rest of it was kind of "meh" for me. Maybe lacking in sweetness / citrus? Personal preference. Sweet but not overly so, which I really liked. No sugar burn, no heavy feeling from too much chocolate. That milk ice cream melts fast so get started right away if you want it paired with your chocolate. Overall, really interesting plates and all three mains tried were tasty. Desserts were okay.